Your first aid manual for preventing and treating common ailments from allergies to toothache. This first aid guide to treating common ailments focuses on just 12 stones that cover a wide range of applications. The guide shows the reader how to identify the right stone for each ailment − the index lists more than 300 specific complaints, including those that occur frequently, such as: allergies, coughs, headaches, hormonal complaints, minor injuries, sunburn, stomach ache and toothache. A beautifully produced crystal handbook and guide for the crystal healer. Whether you are a novice or more experienced, this book has a universal appeal. 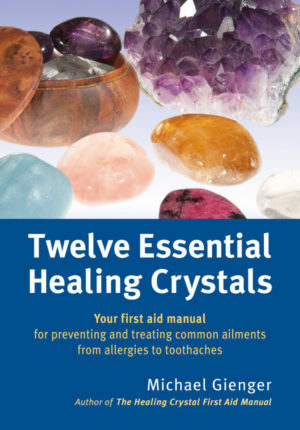 Twelve crystals with their healing applications are offered which shed light on numerous conditions. Highly recommended.